The Housing Communictions Centre operates 24 hours a day, 7days a week, 365 days a year. The Housing Communictions Centre serves as the primary contact on maintenance and security issues for Manitoba Housing properties throughout the Province. In addition, the Housing Communictions Centre monitors alarm and security camera systems. The Housing Communictions Centre monitors are responsible for taking calls from tenants, contractors, and staff; dispatching security or police services, as well as processing maintenance requests and contacting appropriate persons to complete the work after hours. 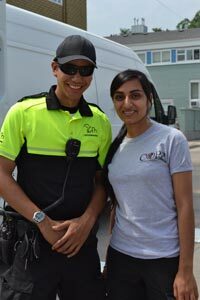 Manitoba Housing Security is responsible for contract security throughout the Province, as well as a 27 member mobile security service which provides call responses within Winnipeg and Brandon. Investigators work with Property Managers, Tenant Services Coordinators, police services, and the Public Safety Investigations unit of Manitoba Justice. Within the City of Winnipeg they respond to major incidents which involve serious criminal acts or the relocation of Manitoba Housing tenants. Technical Support Technicians perform installations of equipment and maintain over 50 security camera systems, as well as office alarm systems and card access systems on Manitoba Housing properties and leased spaces. The Manitoba Housing Communications Centre processes more than 125,000 calls a year; whenever tenants, employees, contractors, other agencies, or the general public require information or assistance regarding our properties � a call to the Housing Communications Centre will point them in the right direction. Manitoba Housing Security attends over ten thousand dispatches to Manitoba Housing properties each year; whenever you feel you safety is in jeopardy or are concerned about activity at a Manitoba Housing property, call the Housing Communications Centre and they will dispatch a Security Officer to investigate. The Security Branch Technical Support staff manages and maintains the Card Access, Alarm, and Security Camera/DVR Systems; whenever work at a property requires the relocation or disconnection of any of these systems or components, a call should be placed to the Security Branch clerk to determine the next steps in the process. This would include construction or elevator refresh programs which have these security systems in place. The Security Branch manages the card access system for the residential buildings and area offices; call us whenever tenants, contractors, or employees require new access cards or identification badges. When other agencies require access to Manitoba Housing properties, they should contact the Security Branch clerk to acquire the Card Access Request forms. Manitoba Housing Investigators assist Property Managers and Tenant Services Coordinators interface with police services in order to deal with criminal matters, or whenever video surveillance footage is required to further and investigation. Police services should contact the Housing Communications Center in order to contact the Investigator on call.